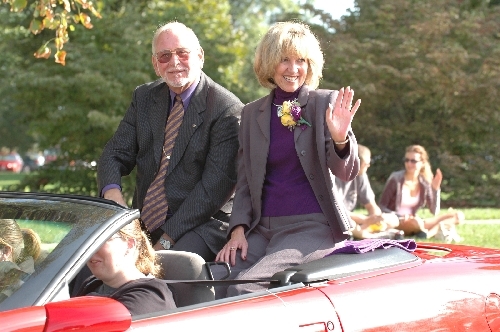 Marilyn and Garry in the 2005 Homecoming Parade. MACOMB, IL -- A celebration of life for Marilyn K. (Dohner) Johnson will be held at 2:30 p.m. Sunday, Oct. 29 in the University Union Grand Ballroom. Visitation will be held prior, from 1-2:30 p.m. in the Union Brattain Lounge from 1-2:30. In lieu of flowers, memorials may be made to the Western Illinois University Foundation, 303 Sherman Hall, 1 University Circle, Macomb IL 61455-1390 or at wiu.edu/giving for the W. Garry & Marilyn K. Johnson Scholarship Fund. MACOMB, IL – A celebration of life for Western Illinois University Former Executive Secretary Marilyn K. (Dohner) Johnson is being planned for later this month. Johnson passed away Oct. 7 in Macomb. Cremation rites have been accorded. For 30 years, the presidents and trustees of Western relied on Johnson for administrative support in her role as executive secretary in the Office of the President. She retired from Western in July 2005 after 40 years of service. Johnson was first employed at Western in 1965 for four years as clerk stenographer for the Journal of Developing Areas. She briefly worked in the Physical Plant central stores and then for four years in the University Personnel Office (now Human Resources) before taking the position as executive secretary in the Office of the President in 1975 for then-President Leslie F. Malpass. Her tenure also included the presidencies of Ralph H. Wagoner, Donald S. Spencer and Al Goldfarb and interim presidents Burton O. Witthuhn and David R. Taylor. When the Western Board of Trustees took office in 1996, the Board named Johnson to serve as secretary. "Not only was Marilyn a consummate professional, she was a genuinely kind and caring person. She will be missed," said WIU President Jack Thomas. "Our thoughts and prayers are with Garry and the Johnson and Dohner families." When Johnson retired in 2005 to assist with the care of her parents, then-President Goldfarb said, "Very few universities are so fortunate to have an individual who has provided such dedicated service to the administrative leadership and trustees. The nature of her tasks is such that she gains very little personal recognition for her outstanding work, but the staff at Western, other universities, agencies and the public have benefited greatly from her unselfish dedication and extra hours of service." In 1999, she was named as one of the 50 Women of Western, and she was named the 2005 Alumni Programs' Honorary Alumna and also the 2005 Homecoming Parade Grand Marshal. In addition to her employment, Johnson was an enthusiastic volunteer in numerous University and community endeavors. She served as co-chair of the WIU Centennial Celebration opening event and served as a member of the WIU Performing Arts Society and the Western Athletic Club. In the community, she has worked with the Fulton and McDonough County Community Mental Health Board, the McDonough County 708 Mental Health Board, McDonough County United Way, Macomb Altrusa Club, and Business and Professional Women's Club. Survivors include her husband, Vice President Emeritus of Student Services Garry Johnson; two stepsons, Christopher and Colin; one sister, Martha Fillingham; two brothers, Mark and David Dohner; and numerous nieces and nephews.